One of the many 4UR veterans who are now still working in the industry or on the water is my good friend Drew. 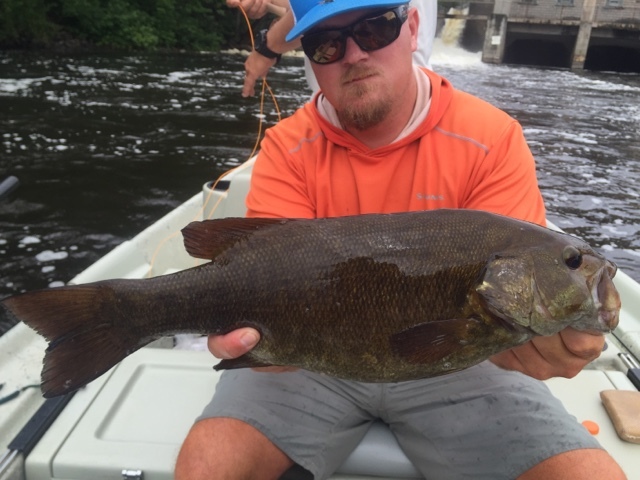 Drew is a Wisconsin native who now guides for the Tight Lines outfit, a group of great Midwest boys who are fishy as hell and super keen on their smallmouths. 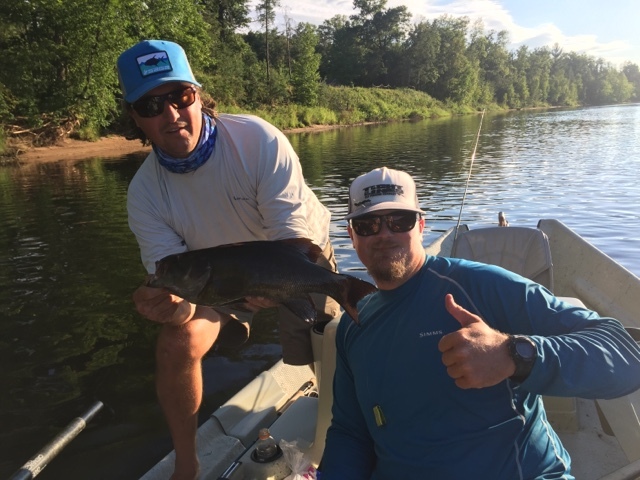 I had the good fortune to join Drew and a colleague for a spell in Pembine, Wisconsin, where the Tight Lines crew lives for the summer season. The owner of the shop, Tim, falls into the description above and was especially excited for me to experience the great fishery they have at their doorstep. I arrived late on a Wednesday to find the beer and whiskey flowing. With an early wake-up approaching fast, several times we all contemplated the beds that awaited us. Tim has a particularly good line of peer pressure that whisks away most reservations about another round, another story, another anything: How often? How often do I find myself in northeast Wisconsin with two of my best buds? 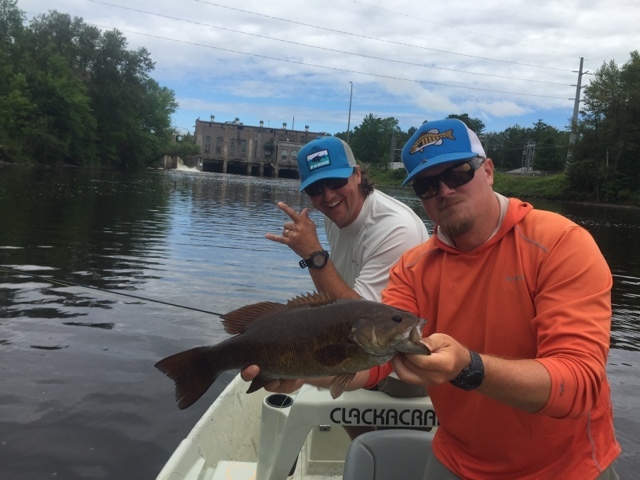 How often do I get to smallmouth fish on the Menominee with two of my best buds? 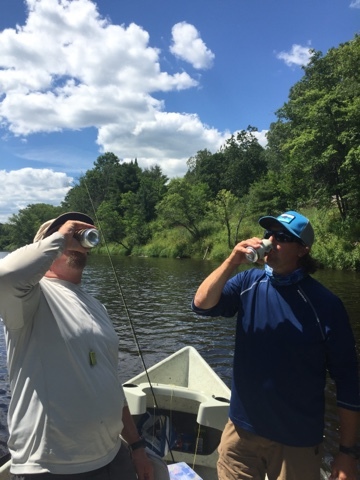 How often can I have one more beer in Wisconsin with two of my best buds? Not very often, is the answer to those questions. I encourage you to employ such a quiz when confronted with decisions over one more beer or staying up a little later. If the answer is 'pretty often', maybe you can find a way to phrase the question to get the answer you desire. 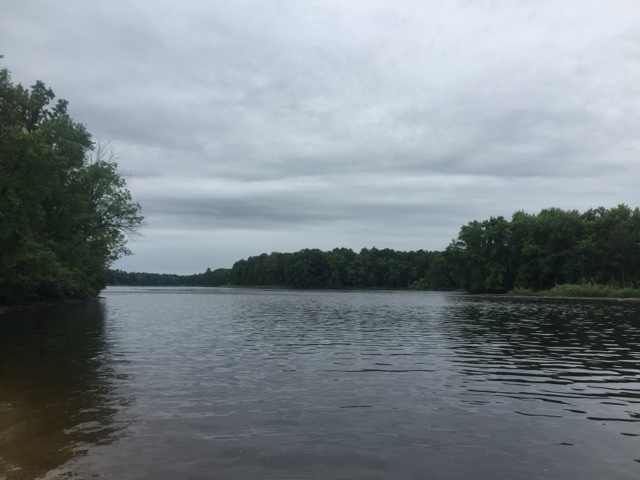 My prior experience with the smallmouth bass was largely in a couple ponds in the Camden-Rockport area, where Lefty Steele and I kept a canoe stashed in the woods when we were working at Maine Sport. We found the fish agreeable to popper presentations there. 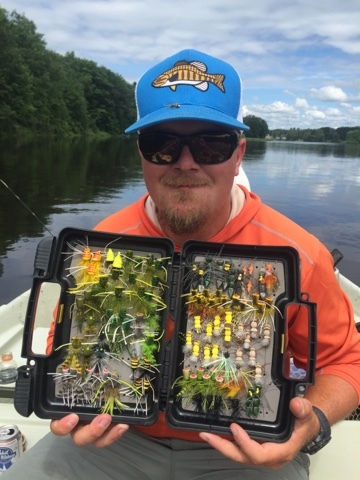 July in Wisconsin is topwater season for the smallies, and our bugs consisted of mostly the same, plus a local pattern known as Ol' Mr. Wiggly. 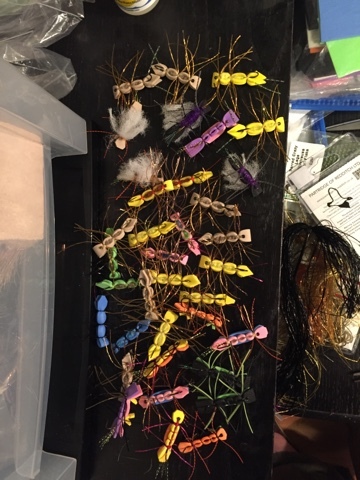 It's a quick tie that I plan to experiment for other species. Perhaps you'll do the same. 19.5" to start the trip. Great! Same fish as above. Looks bigger here, eh? Different fish than above, but just a bit downstream. Twenty minutes into the trip. 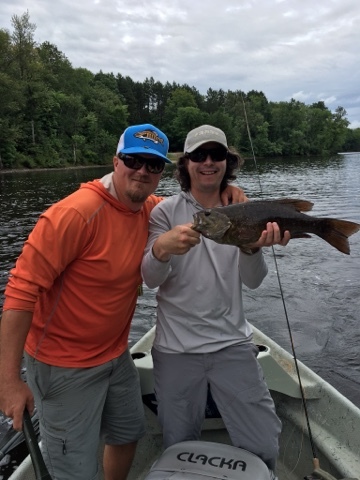 I forgot how much fun smallies are. They pull like hell, corking out 8-weights, eat topwater bugs like the dickens and love that warm water. 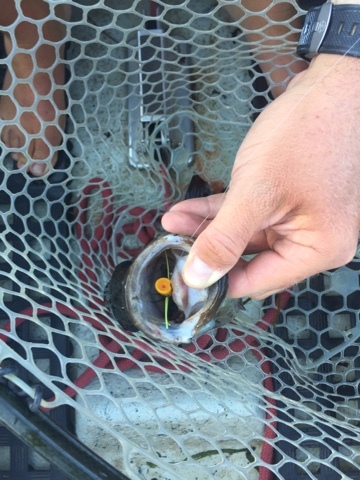 For a summertime fish, they're pretty rad. I'm looking into my smallmouth locals out here. One last story. We had pretty damn good fishing, but like any place you go, it'll slow down from time to time. 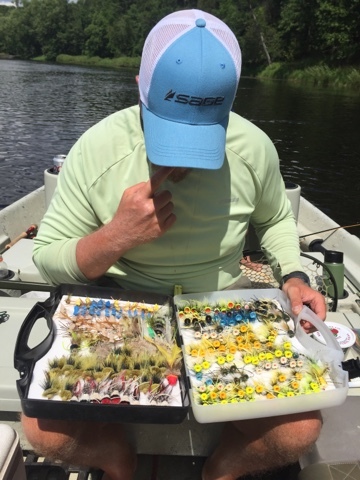 From what I've gathered, the gear and bait guys can really clean up on this river. Case in point, on our final morning, while waiting on Drew to finish running the shuttle, I watched as a party barge (the river is pretty wide and slow) made its way up the middle of the river and then cut its engine directly in front of the boat launch. Now I've heard of 'take-out fish', but rarely do I hear of boat launches being a fishing spot that one might target, or seek out. Nevertheless, the captain of this vessel thought it to be a fine spot. As the boat coasted to a stop mid-river, the captain grabbed the anchor and tossed it into the river: KABOOM! The anchor splashed down, causing quite a ruckus, I thought. 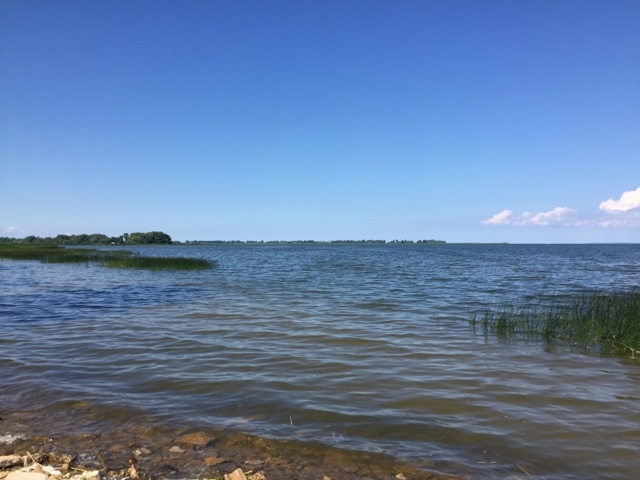 I watched as the man then proceeded to remove his shirt, pull a beer out of his cooler, grab his fishing pole and head to the stern where he took a seat on a waiting chair. He let fly his bait/lure and began a retrieve. A moment later and he had one on! Damn! I guess that does work! It would take us an hour and a half to get our first that day.